Today, I am going to show you two really great toppers from Sally Hansen Color Frenzy Collection. The line is described as glittering splatter-paint effect polish featuring multidimensional shapes and colors and boy does it do that. First up, I have Candy Drops. 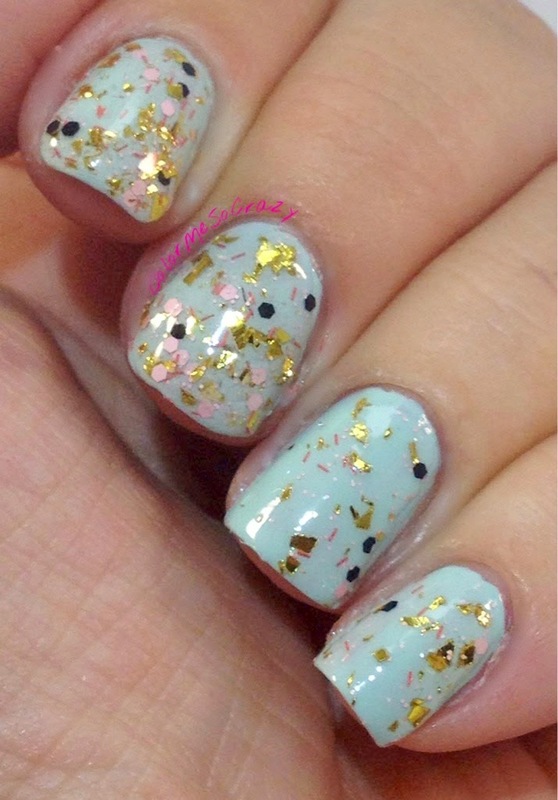 This is a a really delicate glitter. 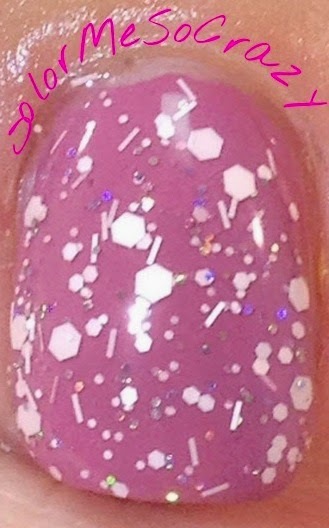 There are pink hex glitters, holo bar glitters and little silver micros in a clear base. I have two coats on my index and middle fingers and 1 coat on my ring and pinky finger. They are all over Zoya Aubrey. I really, really liked this combo and I still cannot decide if I like 1 coat of glitter or 2 or if it doesn't matter because it was such a smooth application. The application of this glitter was really smooth. There was nothing chunky to deal with and I didn't have to fish for glitter for an even application. 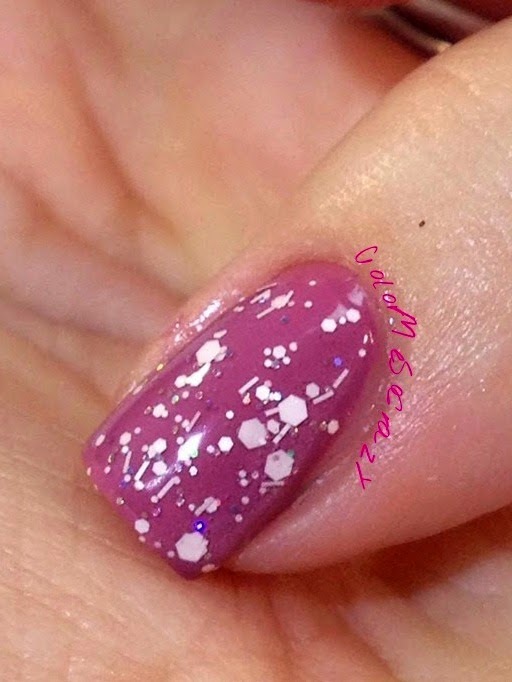 I would suggest using a thicker topcoat to help seal in that sometimes tricky bar glitter. Overall, this is a really great glitter topper. There were so many different undies combinations that I could think of and I cannot to try them. What is your first thought for a color combination? Next up, I have Splattered. 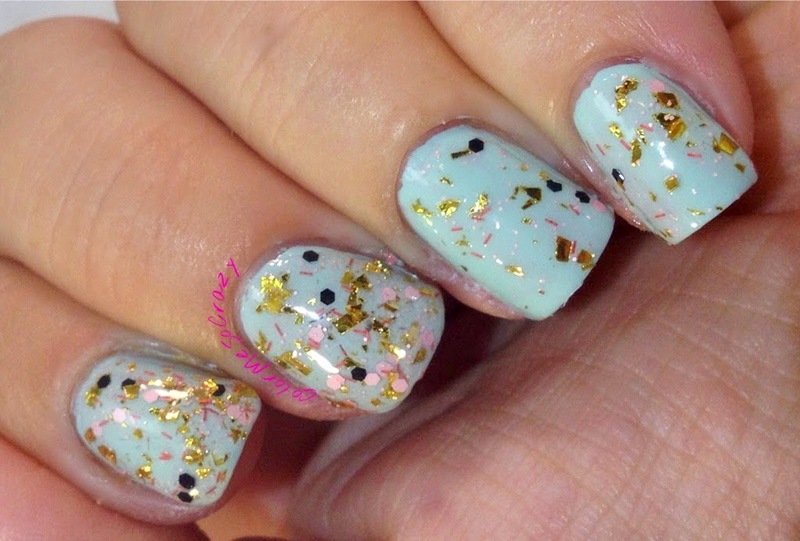 Splattered is a bright fun glitter topper. It actually reminded me of "Nicki Minaj" at first glance. There are so many great colors in one little bottle. I have 2 coats on my index and middle finger and then 1 coat on my ring and pinky finger all over essie Mint Candy Apple. 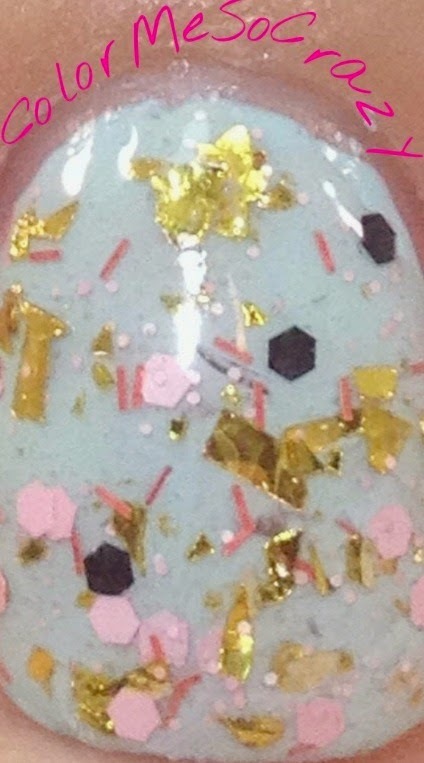 Splattered has matte black and light pink hex glitters, gold shards, white/clear micro glitters all mixed with red bar glitters. What a mix, right?? I love this topper. It is so wild and party like- just like my lady Nicky Minaj! I decided for this one, more is better. Better is more!! Go for the second coat with this one. Over all, this is my favorite out of the two. It is so fun. There is so much going on, but it is so well put together. Be sure to check out the full line of Color Frenzy here. You can find these at just about any grocer or drugstore and even your local Target! These retail for about $10.